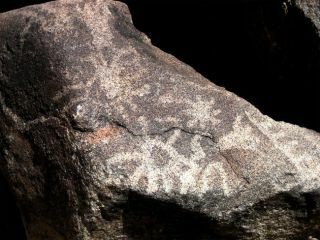 A petroglyph possibly depicting the supernova of A.D. 1006 (star symbol, right of center) and the constellation Scorpius (scorpion symbol, left of center). The boulder on which the petroglyphs appear is located in White Tanks Regional Park, Phoenix, AZ. A shiny coating found on rocks in many of Earth's deserts suggest a new way to search for signs of life on Mars, scientists said today. The coating, known as desert varnish, binds traces of DNA, amino acids and other organic compounds to desert rocks over the eons. Desert varnish has been found in the Atacama desert in Chile, the Mojave desert in California and Canyonlands National Park in Utah. Prehistoric people carved the varnish away, revealing lighter-colored rock underneat to create petroglyphs. The logic is simple: Samples of Martian desert varnish could perhaps show whether there has been life on Mars at any time during its 4.5-billion-year history. "These lustrous chroniclers of the local surroundings can provide a window back in time," said study leader Randall Perry from the Department of Earth Science and Engineering at Imperial College London. "Martian desert varnish would contain a fascinating chronology of the Martian setting,"
The idea is published in the July edition of the journal Geology. Scientists do not know if there is or ever was life on Mars. The planet was wetter and warmer at times during its past, and in theory life could have thrived. Biology might exist on Mars today, perhaps in or near underground pools of water. Scientist say if there is life, it would be microbial and therefore challenging to find with the relatively crude instruments that can be loaded on a robotic spacecraft. But cursory searches at the surface have not revealed any convincing signs of life, past or present. The source of the varnish, which looks like it has been painted onto the rocks, has intrigued scientists since Charles Darwin's time. It was thought the dark color was the caused by the mineral manganese oxide, and that any traces of life found within the varnish came from biological processes caused by microbes in this mineral. New investigations with electron microscopes and other techniques finds instead that the varnish is mostly silica, which has mixed with other minerals to form a glaze that traps organic traces from the surroundings. Perry and his colleagues suggest that future sample return missions to Mars consider searching for rocks with desert varnish. "If silica exists in varnish-like coatings in Martian deserts or caves, then it may entomb ancient microbes or chemical signatures of previous life there, too," Perry said.